A crane is used when trees are close to the street, when trees can be reached via placing the crane in the driveway or driving the crane into the yard. Cranes are very useful when trees are close to the house, between two houses, near air conditioning units or power lines, or to prevent damage to property under the tree. A chipping machine is used to chip away brush and branches. Our chippers will easily chip up to 18 inch in diameter whole trees and branches. The chipping is done at the time of tree removal/trimming, on site. A bucket truck is used in situations where the truck can be driven and set-up. 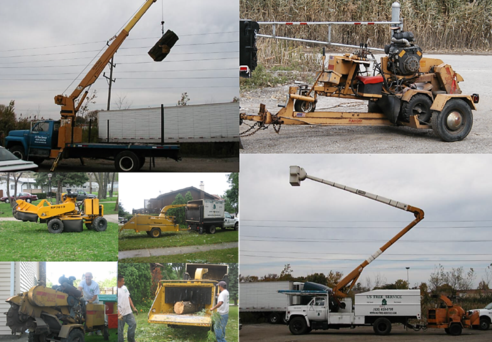 The bucket truck is good for removing small sections of trees and lowering them to the ground. Our bucket trucks reach 55 feet and 65 feet in height. A stump grinder is a machine that removes tree stumps by means of a rotating cutting disk that chips away the wood. Our stump grinders are very powerful ad will grind large stumps in minutes.